Green fees: $45 (Monday-Thursday); $35 (after 2 p.m., Monday-Thursday); $50 (Friday); $40 (2-5 p.m., Friday); $35, (after 5 p.m. Friday); $60/$50/$40, weekend & holiday; $30, senior (55-plus) and military, all times. 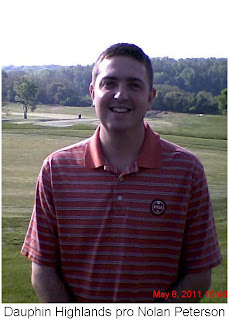 Specials: Go to www.golfdauphinhighlands.com, click on special, tee time specials for selected tee time discounts. A quick road trip to south-central Pennsylvania got off to a rousing start Sunday with a visit to Dauphin Highlands Golf Course in Harrisburg, Pa.
Dauphin Islands looked great on its website and even better when traveling companion George Sweda of Concord Township and I arrived at the place Sunday morning. Carved out of what formerly was an employee retreat for Bethlehem Steel and opened in 1995, Dauphin Highlands is an upscale public course with amenities comparable to a private club. 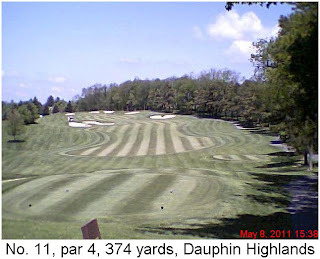 Allowing for the hilly terrain of this part of the country, I'd say Dauphin Highlands is comparable to Little Mountain Country Club or StoneWater Golf Course. Before teeing off, we had time to chat with head professional Nolan Peterson and course superintendent Jon Szerekes. They're proud of this course and should be. It's a challenging layout in top-notch condition save for patches of poa annua on the putting surfaces and some sand traps that were a bit thin and rocky. As you stand outside the pro shop looking toward the first tee, you can't help but notice the steam plumes from the cooling towers of the Three Mile Island nuclear power plant. Those towers are in the panorama at various spots on the front nine. My scorecard is full of shorthand notes jotted down while playing on a splendid, sunny day with the temperature hovering around 70 degrees. We played the white tees at just under 6,400 yards. Personal favorites were: par 4, 269-yard 2nd hole (love short 4s!!! ), par-5, 500-yard 7th hole (dogleg left, uphill); par-4, 374-yard 11th (stout), par-3, 165-yard 15th (over a ravine); par-5, 525-yard 16th (requires pin-point drive and second shot over ravine); par-4, 365-yard 18th (must favor left side on tee shot to avoid large pond on right). 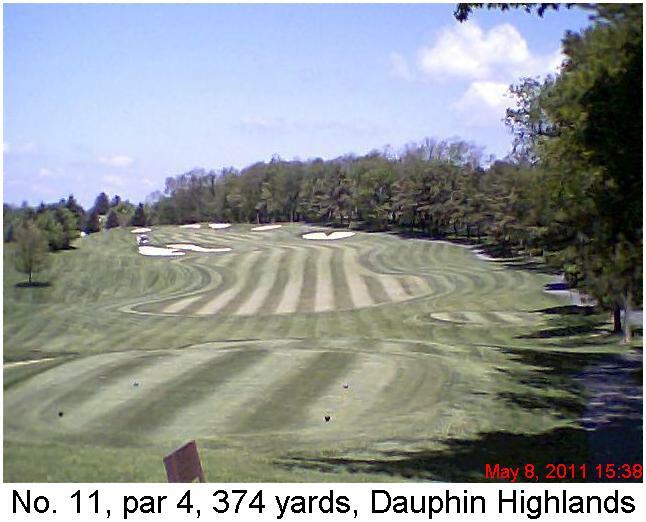 I'd recommend Dauphin Highlands to any Northeast Ohio golfer who doesn't mind hitting the road to have new golf experiences. Harrisburg is 330 miles east from the heart of Lake County. It's an uncomplicated drive - six hours-ish - if you use the Ohio Turnpike, I-80 East and PA 322 East. My guess is, plenty of Northeast Ohioans have passed through Harrisburg on their way to vacations in nearby Hershey, home of the famed chocolate company and the Hersheypark amusement park. Gettysburg, with its storied Civil War battlefield, and Lancaster, famed for its Amish population and crafts, are in the same neighborhood. Lodging is no problem. All of the major hotel chains are well-represented here. 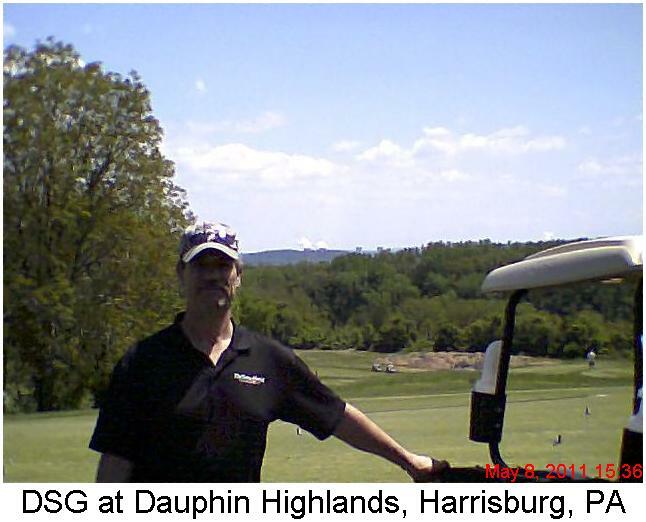 We paid $76 plus tax to stay at a Quality Inn in Harrisburg the night before our round at Dauphin Highlands. I came home in late March from a longer road trip to western Virginia and central North Carolina feeling as if I'd just scratched the surface in identifying affordable golf courses in those areas. With one round in the book here and at least two more to come, I feel the same about south-central Pennsylvania.